I criticized Robert Mueller in June 2002 for meeting with the American Muslim Council and having his spokesman announce that the FBI regards the AMC as "the most mainstream Muslim group in the United States." I worried a year later, when I read about Mueller raising the idea on May 28, 2003, with the AMC and others, of giving Islamists special access to the FBI ("We are considering establishing a national Muslim and Arab working group," his aide Tom Reynolds told an AMC conference a few days later, adding that the working groups likely would have a regular agenda of law enforcement issues). Oct. 8, 2003 update: The excellent news is that Imad Hamad will not receive the 2003 FBI's Exceptional Public Service Award, a Detroit television station reported today. (To view the television report, click here.) The not-so-great news is that between them, Hamad and the FBI can't quite 'fess up to the truth. Hamad states that someone else is getting that award; in fact, two civilians were all along slated to receive the award; he was cut out, not replaced. As for the FBI, it explains the last-minute decision to "evidence referencing Mr. Hamad [that] has been filed in connection with an upcoming deportation proceeding against associates of his." But that's not the whole story; Debbie Schlussel's New York Post story had traction and the accusations that "Hamad supports terrorism and was himself a suspected terrorist" were what caused the uproar that forced the FBI to rescind its award to Hamad. July 6, 2004 update: For another bone-headed FBI award, see my article today, "The FBI Loses Its Way [with Marwan Kreidie]." Sep. 1, 2004 update: Sometime this summer, Leslie Wieser, the FBI special agent in charge in South Carolina addressed the graduating class of the 2004 Muslim Scouts of America at their commencement in Islamville. His speech, "Diversity; The Strength of the American People," has to be watched to be believed. May 17, 2005 update: As I feared, although law enforcement has since 2002 had the legal right to monitor all that takes place in mosques, it does not have the courage actually to do so. At least, that's the policy of the FBI's Chicago office under new special agent in charge, Robert Grant. A report on his meeting with businessmen and members of the United Arab American League in Bridgeview, Illinois, includes this sentence: Grant "assured the group that agents do not monitor religious speeches in mosques and will not investigate citizens because they may be connected to an individual they are investigating." June 14, 2005 update: When I spoke at the University of Washington in Seattle in April 2002, one Jafar Siddiqui (or Jeff Siddiqi) led a campaign by Islamists to get my talk cancelled. As Edward Alexander, the organizer of the event, tells it in "Radical Islam vs. Academic Freedom: One Example," this led to some preposterous name-calling, threats of suits, and even one person getting expelled from a university building. That was then. Now we learn, in a Seattle Post-Intelligencer article titled "Seattle FBI gets advice on Muslims," that the very same Siddiqi was one of 29 people who graduated on June 11 from the FBI's first Citizens Academy in Seattle. As the SPI report puts it, "The academy was made up of seven three-hour sessions that presented overviews of the FBI's major programs, including international and domestic terrorism, foreign counterintelligence, public corruption and white-collar crime." Are you as pleased as I am that the FBI is providing this information to Siddiqi? Better yet, we learn, "Siddiqi was among the most vocal of the participants in the academy, often challenging FBI speakers on topics such as the Patriot Act and its impact on the civil and privacy rights of American Muslims." Best of all, he went to the FBI's Seattle headquarters on June 13 and offered a seminar "to dispel common myths about Islam and its adherents." Comment: The FBI seems to have an instinct to give accolades and receive counsel from the wrong Muslims. July 1, 2005 update: FBI Special Agent Phillip Irizarry of Binghampton, New York, sent a tender "note of appreciation" to the Muslim Scouts of America for letting him take part in a MSA event. July 30, 2005 update: The FBI seems willfully blind to the fact that Islamist terrorism comes from an extremist milieu within the Muslim community. Here is the special agent in charge of the FBI's Joint Terrorist Task Force in New York City, Charles Frahm, digging his head into the sand at a Brooklyn mosque: "This community has been at the forefront of sending the message that terrorism is not acceptable, it's not part of their religion, and it's not part of Islam, period." In what I presume is a bit of an eccentric sideline for a law enforcement agent, Frahm even indulged in a bit of theology: "Islam does not accept terrorism. It is not a cornerstone of your religion." Sep. 30, 2006 update: Hussam Ayloush of CAIR announces on his personal website that he participated in a 10-week long FBI Citizen's Academy program and boasts: "I have really learned a lot from the information presented to our exclusive group of 30, made up of business, religious and civic leaders." The medals did not originate with the police units but were provided by El Sheikh Mubarik Ali Shah Gilani, who resides in Lahore, Pakistan. The scouts were trained by an organization which calls itself Muslims of the Americas [MOA]. MOA is widely believed to be part of Jamaat Al Fuqra [JAF] one of the most radical Islamist groups operating in the United States today and which has founded numerous radical Muslim enclaves across the United States. JAF is led by the aforementioned Sheikh Gilani who is thought to be intimately connected with the kidnapping and subsequent beheading of Wall Street Journal writer Daniel Pearl [it is believed that Pearl was on his way to visit Gilani when he was accosted]. "The fact is religion has been expunged from counterterrorism training," said Sebastian Gorka, a counterterrorism specialist with the Foundation for Defense of Democracies. "The FBI can't talk about Islam and they can't talk about jihad." Added Patrick S. Poole, another counterterrorism specialist, about FBI policies on Islam: "I have zero doubt it affected their investigation of Tsarnaev." The officials said the problem is that most field agents understand the nature of the threat but have been hamstrung by policies imposed by senior FBI leaders who are acting under orders of political appointees in the Obama administration, including Islamic advisers to the White House. The policies have prevented the FBI from conducting aggressive counterterrorism investigations of Islamic radicals or those who are in the process of being radicalized. I'm jealous of my brother who ha[s] [re]ceived the reward of jannutul Firdaus (inshallah) before me. I do not mourn because his soul is very much alive. God has a plan for each person. Mine was to hide in this boat and shed some light on our actions. I ask Allah to make me a shahied (iA) to allow me to return to him and be among all the righteous people in the highest levels of heaven. He who Allah guides no one can misguide. A[llah Ak]bar! The US Government is killing our innocent civilians but most of you already know that. As a [UI] I can't stand to see such evil go unpunished, we Muslims are one body, you hurt one you hurt us all. Well at least that's how muhhammad (pbuh) wanted it to be [for]ever, the ummah is beginning to rise/[UI] has awoken the mujahideen, know you are fighting men who look into the barrel of your gun and see heaven, now how can you compete with that. We are promised victory and we will surely get it. Now I don't like killing innocent people it is forbidden in Islam but due to said [UI] it is allowed. All credit goes [UI]. Stop killing our innocent people and we will stop. 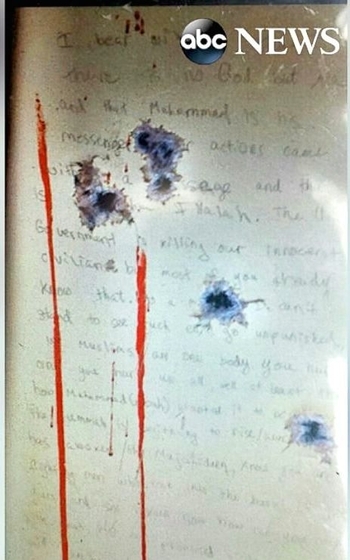 Dzhokar Tsarnaev's note scrawled on the boat where he hid.